Philip Hammond has said the UK is willing to consider other proposals to reduce levels of EU migration amid reported opposition to its plan to limit access to in-work benefits. The foreign secretary said the UK's plan to stop migrants claiming in-work benefits for four years was the "only proposal on the table" right now. But he said alternative ideas that had the "same effect" would be listened to. No 10 has rejected media reports that it may back down on the key demand. Downing Street has said David Cameron will put forward the benefits waiting time when EU leaders discuss the UK's renegotiation aims at a summit later this week and insisted the British people need action on this and all other aspects of his four-point plan. The prime minister is pushing for EU reforms ahead of the UK's in-out referendum, which he has promised will take place before the end of 2017. Ministers say the "pull factors" encouraging migrants to come to the UK need to be addressed but several European leaders object to the UK's proposals while Conservative Eurosceptics argue the curbs will make little difference to overall levels of immigration and the focus should be on reclaiming powers for the UK Parliament to set its own borders policy. 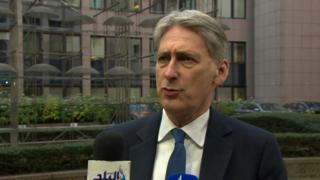 Speaking ahead of a meeting of foreign affairs ministers in Brussels, Mr Hammond said requiring EU migrants to wait four years to receive in-work benefits, such as tax credits, had been a "consistent demand". "We've put that proposal on the table. It's very clear," he said. 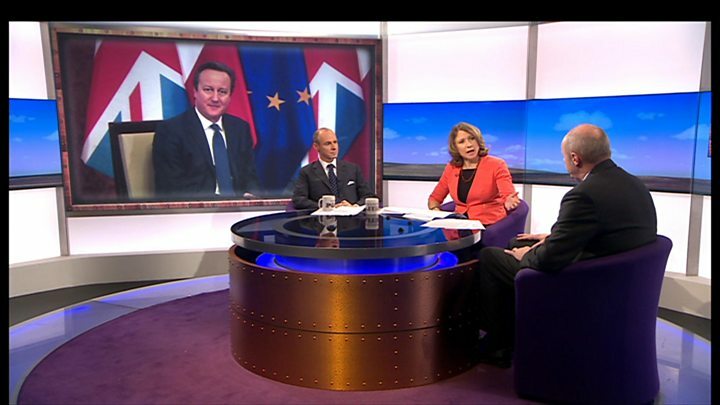 Media captionIs PM's renegotiation meaningless? But he suggested the UK was prepared to look at other options as long as their ultimate impact was the same. "We've heard a lot of our partners in Europe have concerns about it. So far we haven't heard any counter proposals. We haven't heard any alternative suggestions that will deliver the same effect in a different way. "But we have made very clear if people have other ideas that will deliver on this very important agenda for British people we're absolutely prepared to listen to them and we're prepared to enter into a dialogue about them, but at the moment the only proposition on the table is our four year proposal." The prime minister, who spoke to his Slovakian counterpart Robert Fico on Monday to discuss the UK's renegotiation, has acknowledged no agreement will be reached this week on the UK's wider agenda for reform. But senior Conservatives are hopeful progress can be made paving the way for a possible deal in February. Asked whether Mr Cameron was prepared to compromise on the four-year limit, Downing Street said he was "open to looking at new ways of dealing with the issue" but the basis for discussions would be "what's on the table". The Mayor of London and Conservative MP Boris Johnson said the rest of the EU had "recklessly" disregarded a proposal from the UK which he believed would go down well with their citizens. "These people are radically and dangerously misreading the prime minister if they think he wants to stay in the EU at any price," he wrote in the Daily Telegraph. "The David Cameron I know is much more Eurosceptic than some of his senior colleagues." And Tory MP Kevin Hollinrake told Radio 4's World at One that the EU need to wake up to public concerns about migration in the UK, warning "the whole EU project could fall apart" if the UK voted to leave. But the PM is also facing a backlash from some within his own party who argue he has not been bold enough. Former Environment Secretary Owen Paterson likened the PM's position to "someone bobbing about in the back of a dinghy, being towed along by a Channel ferry", arguing his negotiations were "froth and nonsense" compared with the much bigger question of the future shape of the eurozone. And the Conservative MEP Daniel Hannan told the World at One that the UK was "banging the table and angrily demanding the status quo", having abandoned hope of securing meaningful opt-outs from social and employment laws or European court judgements. Appearing before a committee of peers, Europe minister David Lidington said the UK had to be "sensitive" to the concerns of former Eastern Bloc countries about migration, saying their history under Communist rule meant the issue had a particular "emotional resonance". But he suggested other EU countries were "quite shocked" that the UK, according to demographic trends, was set to overtake Germany as the EU's most populous country by 2050 and he believed a "good agreement" could be reached in this and other areas. Mr Lidington said there was a "way to go" in the negotiations but this week's meeting would signal "where we can see low hanging fruit" and what other areas required more time and work, adding that he suspected "nothing is going to be agreed until everything is agreed".